I hope you are all enjoying these fantastic blog posts from some great Aussie bloggers. Hi! Cathy is one of my favourite nail bloggers so I was really excited when she asked me to guest post for her while she's holidaying in QLD (so jealous). I've seen Cathy do some amazing holo gradient manis and I've been meaning to try one for a while now so I thought this would be a good opportunity. I used three polishes from the China Glaze OMG collection, QT, LOL, and DV8. I applied each of the colours to a cosmetic sponge in lines and sponged a few coats onto my nails. I actually learnt this method from Cathy, she posted a tutorial video not long ago. The first photo was taken in a lightbox, the second was taken in the sun. I used Ulta3's top coat to give it some shine but it really killed the holo effect. The holo was barely visible in person too. I like how the gradient turned out despite the holo fail. 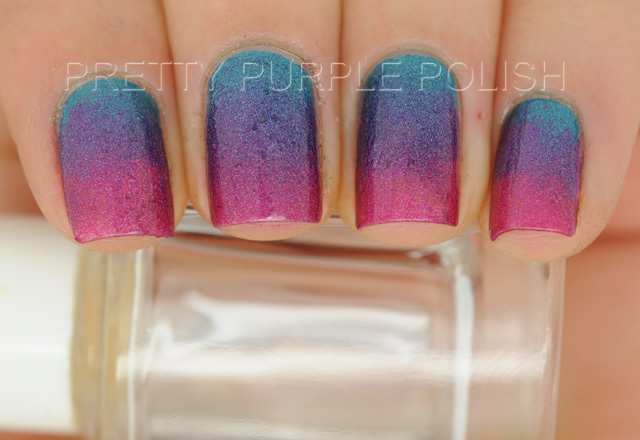 This method of sponging a gradient was really easy and I'll be using it again. Thanks for reading, I hope you enjoyed my post. Alanna - I love this colour combo. I'm going to have to pull out my OMG polishes to create a gradient with them. 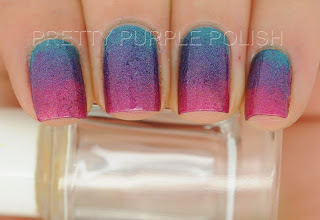 Thanks so much for guest posting Alanna, and everyone else, please give Alanna some love over on her blog - Pretty Purple Polish. I love this color combination. 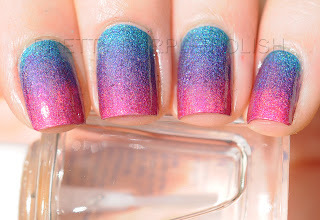 I just have to try a gradient mani soon - they always look so eye catching and I love this color combination. These look fantastic! I am definitely going to give this a try sometime soon! so pretty!! and great blog! This looks so pretty ! !